Bees are scrambling like mad for space on my coneflowers (Echinacea). I never had much luck with perennial coneflowers when they got only morning sun. After moving them to the sunny side of this bed, there’s plenty for everybody! Texas Crescent butterfly, among many, zoomed in for dinner. Along a semi-shady stretch dotted with sunlight, Johnson’s amaryllis sparks up a fence bed, against screening shrubs ‘Spring Bouquet’ viburnum and fragrant sumac (Rhus aromatica). This week, Jeff Ramert from the Round Rock Garden Center joins Tom for perennial punch in sun, shade, and in-between. To quickly screen a view or hide a chain-link fence, check out spring-blooming Mirror Leaf viburnum (Viburnum odoratissimum ‘Awabuki’). After flowering, cut back the glossy evergreen foliage to desired height. And it’s deer resistant! In sun, native Hamelia patens stops the show in summer and fall with fiery blooms that escalate hummingbird and bee photo ops! For smaller spots, try dwarf firebush, Hamelia Patens ‘Nana,’ that grows to just 3×3’. Evergreen pineapple guava accents in sun to part shade. Prune to shape as a specimen tree or shrub. Mine was one of my “brilliant ideas” to define a patio against the shady fence-side bed (and to shield view from fence). To hide the fence beyond, ‘Big Momma’ turk’s cap (one of Jeff’s powerful perennials) will soon stride to 5-6’ to change that view. Also, newly returned Mexican honeysuckle (Justicia spicigera), shrimp plant, (Justicia brandegeana), plumbago, regular turk’s cap, and native rock rose will dazzle that view, complete with hummingbirds. Jeff tells us more about Mexican honeysuckle, a delight in those part sun/mainly shade spots. For now, the pineapple guava’s sporting pink-hued blossoms, its spikey red stamens an enticement for bees and hummingbirds. With luck, this fall we can try the fruits. Watch now for all of Jeff’s plants and growing tips! Another orange Justicia that mixes beautifully with Salvia farinacea and plumbago is orange shrimp plant (Justicia fulvicoma), Daphne’s Plant of the Week. Growing 2’ tall and about twice as wide, it’s a sure hit with hummingbirds and butterflies. If sun only hits your patio or deck, snag a large container to bring the show up close. Like the more common shrimp plant, Justicia brandegeana, it will usually die back in cold winters. Simply prune to the ground for almost instant comeback gratification. Find out more about orange shrimp plant. Since we’re as busy as bees these days, spare those aches and pains with pre and post garden stretches along with Trisha and Paul Smith, M.Ed. / Fitness Professional at Lake Austin Spa. Try these at work, too, for a great break to stretch tense muscles and boost your energy! Barbara and Paul Loyd in Fredericksburg have some interesting silver growth on their ash trees. These are lichens, Daphne tells us. We reached out to Guy LeBlanc of Tree Care by Guy, to get the Certified Arborist scoop. He confirmed that the lichens are harmless, since they don’t invade the plant tissue. But, as with ball moss, if enough lichens are present, they do stunt growth by covering the surface of the bark and inhibiting branching and the production of new leaves. Guy and Daphne also point out that these lichens can be a result of drought stress that caused the trees to lose their leaves. With more sunlight getting to the bark, lichens are able to thrive, reproduce, and spread. Find out more. 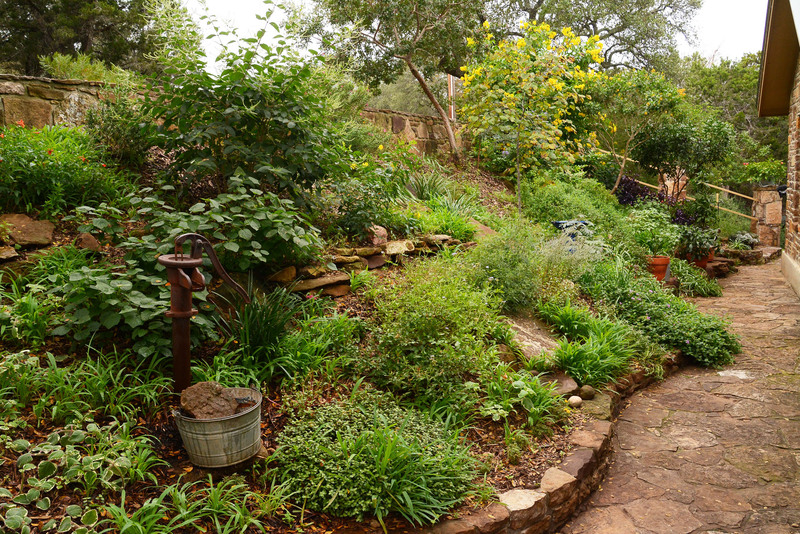 Heads up on this free, self-guided San Antonio Garden tour! April 8, see how to grow beautifully without lots of water on the Watersaver Landscape tour. On CTG’s tour: After living in Santa Fe, Kathy Lund wanted a water-thrifty garden when she moved to Austin and renovated a 1960s home. Long hours as a veterinarian called for low care plants that didn’t demand lots of spare time. Friend and former husband Richard Lund of Grupo Pacific in Carlsbad, California styled the exterior’s facelift with slatted panels. James Mack, of Jemco, executed precise construction. They also teamed up to design and build slatted privacy fences anchored with stainless steel. They enclose a small courtyard patio. Landscape designer Bud Twilley created walk-around paths that control flooding near the house. He planted low-care agaves, yuccas, and sotols. He also turned Plain Jane flat into terraced levels that slow down rainwater runoff and prevent erosion on the sloping grade. He revamped the entrance walkway with offset limestone pads for a meandering pathway to the front instead of a straight shot from the street. Gravel tempers rainfall on the slope to let it slowly sink in. Bud used smaller rainbow gravel near the house. In a hard rain, mulch would simply wash.
At the curb, he used larger gravel along the street to deter dogs. A swath of Zoysia grass softens the upper terrace. Raised steel beds contribute to the look, but also as a stopgap to rushing water. Drought-tough native flowering perennials join architectural succulents. In this new garden, Bud left plenty of space between plants to avoid overcrowding when they mature. Although Kathy wasn’t concerned about privacy in this companionable neighborhood, summer and fall standouts like Salvia leucantha and Pride of Barbados break the view from the street. Although Kathy maintains the garden, it’s not even a weekly chore. On her front porch, Richard and James collaborated on what they’ve all dubbed the wine bar. Kathy and friends can hang out to watch birds, hummingbirds and all kinds of butterflies and bees.